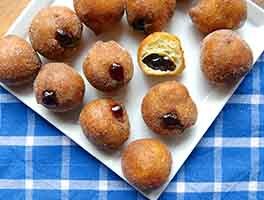 Old-fashioned cake doughnuts were deep-fried in hot fat; NEW-fashioned cake doughnuts are baked in a hot oven! Use a doughnut pan and this tasty recipe to create your choice of doughnuts. 15 mins. to 17 mins. 25 mins. to 27 mins. 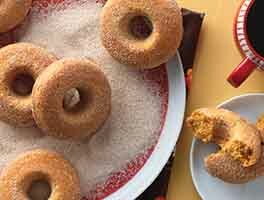 For cinnamon doughnuts, shake warm doughnuts in a plastic bag with about 1/4 to 1/3 cup cinnamon-sugar. For sugar-coated doughnuts, shake doughnuts in a plastic bag with about 1/2 cup non-melting topping sugar (for best results), or confectioners' sugar. For frosted doughnuts, see our three easy doughnut glazes. 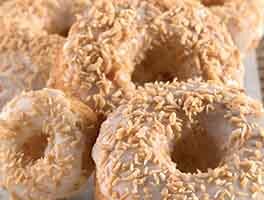 Sprinkle the glazed doughnuts with toasted coconut or chopped nuts, if desired. 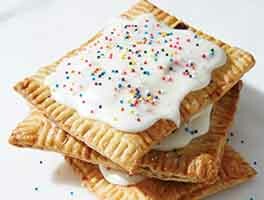 Why use non-melting white sugar instead of confectioners' sugar? Confectioners' sugar will melt and disappear; non-melting white sugar will keep the doughnuts nice and white. For chocolate chip doughnuts, stir in 3/4 cup chocolate chips, mini chips preferred. If you make chocolate chip doughnuts, fill each well of the pan right to the rim with batter. Mine didn't brown, stayed white and unappealing looking. Also kinda dry. No donut pan? No problem! The Mini-Bundt Pan works nicely. You'll get large donuts, but I doubt anyone will complain. I took a page from traditional cornbread baked in an iron skillet and put the metal Mini-Bundt Pan in the oven during pre-heating. Then I generously greased the HOT pan with solid shortening (I use lard.) Listen for the sizzle while spooning or piping the batter into the hot pan. Crispy crusts and tender cake donuts! These were so delicious! Does anyone know if they freeze well? Horrible waste of time and ingredients. Just pulled my first batch out of the oven. Cooled slightly and tossed them in powdered sugar. I made 24 using a mini doughnut pan. I used a piping bag to transfer the batter into the donut tube for uniformity. I also opted for buttermilk since that is what I had on hand. Absolutely delicious! Love these! So much fun to make on a snowy day. I followed the advice of another reviewer and used buttermilk, and flipped after the 10 minute baking time, so that the other side of the doughnuts would have a few extra minutes to get a bit of color. The vanilla glaze recipe was excellent too. I really appreciate that KAF provides recipe instruction options by weight - my recipes always turn out better when I measure in grams. I love this recipe and plan to make it many more times! ...but my young daughter does not like the nutmeg flavor. Any recommendations on alternative spice/seasoning to use to flavor? I used a mini-muffin pan, baked for 12 minutes, dipped the top in the vanilla glaze after cooling. They were great.